Civil Engineering projects (Public Works) cost a lot! The big scale of them is a part of what makes the career fun. You get to deal with big budgets, design huge stuff, watch the dirt move, see it built, and hopefully see it used. I have had the lucky experience of dealing with some semi-large scale projects first hand through my position at work these past two years. I have been working as a consultant on the Program Management team for a rail corridor that has ~22 projects in progress. The total cost to build all of the projects is in the high $700 million region depending on who you ask. Each individual project has its own budget within the public agency's overall budget and as part of my job I get to have a direct hand in setting these budgets in their yearly update process. Here is the magical sequence we use to budget a project. Note: We follow the Design-Bid-Build method of project execution and this is for the general Southern California region. 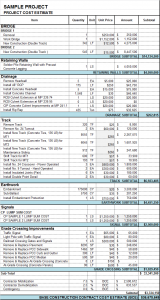 We take this total cost estimate and make it as "raw" as possible. This means we strip out any design costs or management fees that the other consultant may have included in their estimate, leaving only the cost for a contractor to do the work. We call this stripped down estimate the Base Construction Cost (BCC) or Base Construction Estimate (BCE) and use this number to "derive" other costs of the project. These derived costs are generally referred to as "soft costs" versus the construction “hard costs”. Adding these percentages up exactly gives you a rough rule of thumb for the total cost of about 1.45 to 1.53 times the Base Construction Estimate. People toss around 1.5xBCE as the accepted rule of thumb pretty often. 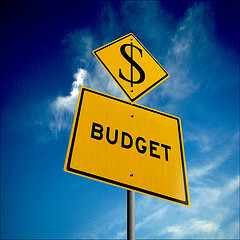 What do each of these budget categories entail? Administration is the cost of the project manager (client/owner or another consultant) and also the program manager (us) both during the design and construction period of the project. This is the cost to design the project. Typically one "prime" design consultant is chosen to design the project, and all other design related tasks that may involve other consultants go through them. This budget is for ALL of those related tasks. You may be asking, what is left to be designed? In my experience after a finished set of plans has been delivered to a construction contractor, they almost always want to make changes to it. Whether it is to reduce costs, or improve the design based on their field experience, and to compile the As-Built plans (the plans after the work has been completed). Typically the same designer that worked on the project earlier remains the "prime" designer during construction. These big projects nearly always impact the environment in some way. Whether it is major and they need to mitigate their environmental damage, or it is minor and they just need to state their minor impacts, environmental studies need to be done, and somebody needs to manage that work. We use environmental sub-consultants that are managed by an environmental program manager and they complete all of this work, which is good, because I sure don't want to deal with the environmental agencies! The Construction Managers deal with the Contractor on behalf of the owner/client. They are usually a consultant. Other things I have seen falling under construction management are support items like dealing with local traffic agencies, traffic safety measures etc. It is inevitable that the site conditions will be different than what the designers thought. Contractors use this to their advantage to get some extra work, extra work that they get paid for. That is charged to this budget item. Also if the Construction Manager, on behalf of the owner, decides some extra features should be added to the project, that also comes out of this budget. Typically 10%, though we budget for this, it is never shown to the contractor, otherwise they would know they can go for it. Of course, they probably know anyway since it is so common. This is the cost of all of the Construction Items. That is how budgets seem to be calculated in my general area in Southern California. The percentages vary slightly but I am using some ballparks. I am curious to know how it differs in other areas.